Helios Creed. An incredible singer/guitar player who started out in the science fiction, psychedelic punk band Chrome in the mid 1970's through the early 1980's. After leaving Chrome he went solo, recording several albums from the mid 1980's though today. His best work is Lactating Purple"(1991). It is die-hard psychedelic space rock, like a much, much heavier 1970's Hawkwind. The vocals are back-masked and distorted beyond recognition. The music is blistering, mind blowing space metal, with heavy, backwards, slowed down and sped up guitar tracks layered over a fast, driving beat, loaded with distortion. 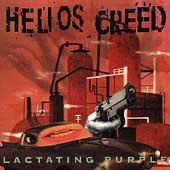 Helios Creed's guitar playing brings to mind Jimi Hendrix at his strangest. Helios Creed's philosophy of the guitar is to turn everything on at once and see what happens. "Lactating Purple" gives you the feeling of traveling through space at light speed, loaded on psychedelics. Of course there is some time for you to land and stretch your legs, to soak in some bizarre alien landscapes before you blast off again into hyperspace. Helios Creed has left behind a huge body of material throughout his career. Start out with "Lactating Purple" and venture out into his other albums if you like what you hear. If you're like me you will be hooked, and you will be on a life-long quest to find everything he has ever recorded. And believe me, it is a daunting task indeed. Here's "Nebuchadnezzer" and 'Modular Green", both from "Lactating Purple". Enjoy, and have a safe landing.